Welcome to the second episode of Coffee with a Journalist featuring some of the most popular and coveted journalists covering the tech industry. This week we had the opportunity to sit down and share coffee with Abrar Al-Heeti from CNET and talk about how she established herself early-on, her big move to San Francisco, and how she loves incorporating anecdotes in stories. Enjoy this weeks episode with Abrar Al-Heeti and take a few notes in case you're interested to pitch her on a story soon! Jered: Okay, welcome to this week's episode of Coffee with a Journalist, and it's a podcast that's just that. We got coffee, we got journalists, we got lots of good conversation. I'm Jared Martin, I'm the co-founder, and COO at OnePitch. Beck: And I'm Beck Bamberger. I'm also the co-founder of OnePitch, the CEO of Bam Communications, and your host for today's podcast. Today, we have Abrar Al-Heeti from CNET, and I love the way she got her way into a fantastic job at CNET. It was through an internship, and then she got a job offer, and it was a little bit of a different path in which she got herself to San Francisco. So, you guys are going to enjoy, and I'm excited to have you listen to her now. Beck: You guys, today we have a fantastic guest here. We're in a little phone booth, technically. It's Coffee with a Journalist slash water today as it is, 'cause it's late in the afternoon. Beck: Exactly, and I'm very pleased to have on with us today, Abrar Al-Heeti from CNET, who's going to be telling us quite a bit on her story to get to CNET so far, what it's like to be in San Francisco coming from Illinois if I got that right? Abrar: That is correct, you got that. Beck: And what's going on in media, and the whole life of you. Abrar: Yeah. I can't wait. Beck: I can't wait either. So first, Illinois. Beck: What was it like growing up there? Especially American-Muslim. Beck: Different landscape, quite different from San Francisco. Abrar: Yeah, slightly. Slightly, right? Beck: Slightly. Tell us what's up. Abrar: The good thing is, I grew up in a college town, Champaign, Urbana. So, I like to think of it as a miniature Berkeley in the sense that a lot of the environment, the culture, the open mindedness was definitely present. I think I'm very lucky, because for a lot of Muslim Americans, they didn't grow up in towns that were as open minded, or accepting, and so that was a very positive aspect of my upbringing. Abrar: I was born, and raised there, went to school there, got very familiar with it, my dad owned businesses there, so you kind of get to know the town, and you know the people, the weather is intense in all seasons, and so I feel like especially with something like journalism, it's more beneficial for you to find something that's in a place like San Francisco, or wherever it may be where you get more visibility. Abrar: I did have fantastic internships when I was in Champaign, Urbana at the local paper, and at the local radio station, but being here, I've been exposed to opportunities that I never would have gotten in Illinois, but I'm so grateful for my upbringing there. Beck: Did your family purposely pick there? Beck: Not like, "Oh, I want to move to California." You don't usually say, "I want to move to Illinois." Abrar: Right, exactly. So, my dad was getting his PhD, you know, grew up in Iraq, and then they moved to Champaign, Urbana to get that degree from the University of Illinois, and then me, and my siblings all went there too so, proud Illini. Beck: Oh, so the alumni continues. Abrar: Oh yes, we have a strong allegiance to Illinois. Beck: Excellent. Now when you were there, well actually you got your master's in journalism. Beck: And you also got a certificate in public relations. Beck: Interesting, we rarely hear that. Beck: So, tell us about how you thought of journalism as a career, or something at least to, "Hey, I want to get a degree in this," and then we can talk about the PR part. Abrar: Yeah, yeah. So, I have a sister who is 11 years older than me, and everything she did was an example for me. She was my role model, she still is, and she was getting her degree in journalism when I was a kid, and so I'd always loved writing, and I always needed a way to kind of figure out how to write, and make money in some way. Abrar: And you know, I figured journalism is a way to do that, and that kind of planted the seed for me, and that was like an outlet for me to be able to do what I wanted to do. So, that was a huge motivation for me. Yeah, and so I actually started off as an English major when I was an undergrad, but on the first day, on my orientation day, I told my advisor that I would probably switch to journalism at some point, and I in fact did about a year, and a half later. Abrar: So, just made the jump, and I sat there in my Intro to Journalism class, and there was just one day when I was like, "Yeah, this is what I'm doing." It was just like, clear as a bell, just like instantly it was like, out of nowhere it was like, "Okay, I need to apply to switch into journalism," and it had always been in the back of my head, but there was that definitive moment where it was like, "Okay, this is it." Abrar: You know, I should, but I think there was that element of like, we had been talking about the kinds of things that you do as a journalist, how you're getting up, and talking to people, and doing things. So, I don't remember specifically what the topic was, but it was more of that like, 'Yeah, I want to be active, I want to be out there, I want to talk to real people. I don't want to just read something that was written 200 years ago', you know? Beck: We all know that student. Abrar: Yeah. Yup, and we usually don't like 'em, but that was me. Beck: Hey, that's all right, and you also then were an intern at the paper. Beck: Okay, so that's where you got your feet wet. Abrar: Exactly. So, I interned at the The News-Gazette, which is the local paper in my hometown. That was probably one of the most critical elements of helping me develop, and learn as a reporter. It was such an excellent experience. You know, you get to hop in your car, and drive to whatever part of town that you need to go, and talk to people, such smart, and kind editors, so that was really, really helpful to me, and that was, you know, besides the student paper, which was also I think without working at the student paper, I wouldn't have learned half of what I learned, just 'cause it was practical knowledge. Abrar: And then to transition into a paper where the editors were seasoned editors, and you know, they're adults, and we were all students at the paper, and we all did our best at The Daily Illini, but when I went to The News-Gazette, it was a real paper where I got to just dive right in. Beck: So, what kinds of stories were you doing there? Abrar: Yeah, the ones that jump out to me, I love doing features, and I love profiling people in the community. Like, I remember there was a story, I think maybe my favorite one was, you know, this family reunion that had been going on for like, you know, years, and years, I don't remember, it was a hundred years, something like that. Abrar: I don't even remember, but their last family reunion was going to happen that Summer, because everyone had just died off, and the young people lost interest, and so I got to cover this very personal, that's the fun thing about local news is you can do fun stories, just because the person is in your community, and then I wrote that story, and they invited me to that last family reunion, which was so sweet, 'cause I was there with all the family, and it's so touching. Yeah. Beck: That's a choice story. Beck: That is like, small town news that is so touching. Beck: I imagine too you must've, as just someone who would be at that paper, or would get quote, unquote pitches, or somebody down the street being, "Oh, my neighbor's doing this, and this," you go like, "Great, I'm going to go do it." Abrar: Exactly. Only there could you do something like that, right? Beck: Oh, that's great. So, tell us how then the public relations certificate came in, and bigger, why? Beck: Yeah, oh wow. So, that was your job security. Beck: Did you have any idea of even what that world entailed prior to pursuing it, other than it was adjacent to journalism? Abrar: Yeah, not very much, and I think a lot of the courses that contributed to that certificate were crossovers between journalism, and PR, a lot of communications courses, and whatever it may be, but no, I didn't fully, and I think I still don't particularly fully understand what the typical day of someone who works in PR is. Abrar: I get the gist, there's pitches, I get the emails, I get all that, but you know, I think obviously I think it's a lot like journalism in the sense that you don't know exactly what your job entails until you do it. Beck: Very true. So then San Francisco. Beck: Quite the leap. How did that happen? Abrar: So, I was looking for internships when I was close to finishing my masters, I was looking for Summer internships. I figured an internship might be better, 'cause you kind of test it out before you leave, and do a job. It's also easier to get an internship. Beck: Very good point, very good point. Abrar: And then you get your foot in the door. So, I was looking on Indeed, and I saw this listing from CBS Interactive, and specifically CNET, and I applied like I did with a few other jobs not really expecting much. I remember I was sitting in class one day, and I get an email from somebody at CNET saying that they wanted to interview me, and I couldn't believe it, couldn't believe that it was actually happening. Beck: Wait, wait, wait. Let's back up, let's back up, back up. So, were you like day two on the internship you were like, "Hey guy, I really want a job." How did you finesse it? Because I bet a lot of people are sitting in that, have the foot in the door somewhere, they're with an agency, or they're in a newsroom, and they're going, "How do I now leverage this?" Beck: I was just having this conversation with one of our interns at our place. Beck: So, how did you exactly on a strategic level do this? Abrar: So, I definitely didn't do it in the beginning, because I had to win them over. I had to be a good person, I had to be a good reporter, and so I just worked hard for the first month, and a half, two months. Abrar: It was a three month internship about, and then closer to the last few weeks, I asked our Editor-in-chief to go to lunch, if we could go to lunch, and we chatted, and I was trying to muster up the courage to be like, "So, I really like this internship. I would like to stay," and you know, she was like, "Yeah, we'll evaluate your work at the end, and try to see if," and I was like, "Okay, all right," so I was hopeful. Beck: Oh, so you're in that lunch meeting, and she didn't say, "Oh yeah, absolutely. Oh my gosh, we have an opening." It was, "We'll see." Abrar: Well, there was no opening. Abrar: So, there was opening. So, you have to figure that out, but she was very optimistic, and I felt optimistic afterwards, and she wasn't like, "Oh, you're out of your mind," she was like, "Yeah." I think that's a natural thing. Once you have an intern, you're like, "Okay, do we keep this person?" No one's trying to waste their time, and just have somebody join the team for no reason, you know? Beck: No, not at all. That's an investment. Abrar: Exactly. So, it's kind of like, I get to try out the job, they get to see if they like the intern, and then if it works out, it works out. So, they were still in the process of figuring everything out after my internship ended. Abrar: So, I went back to Illinois for about three weeks, and then got the call that I had a position, and then I immediately began looking for housing which took months, but I worked remotely from Illinois for about nine months, and then moved back. Beck: Worked remote for your first job? Abrar: Yes, can you believe that? Abrar: Can you believe it? Aren't they the best team ever? Beck: One, yes. Two, how did it take so long to find housing? I mean, it is a disaster here, we're San Francisco right now, and okay. Abrar: That was partially it, and the other part of it was saving up for the ridiculous rent. So, they were nice enough to tell me, "You're going to have to save money. You know, you're probably going to save money for this, feel free to stay at home for a few months," and I did, and in the process I was looking for housing, and so those two elements together contributed to that weight, and then I finally found something, and moved here in May. Beck: ... a situation of, "Oh yeah, you're hired, but heads up, you can't probably move here, so just stay back where you are, and then move out to the city that we just employed you in." What? Abrar: I like to take it as a huge compliment, right? Beck: Oh, it is huge. Abrar: It's like, "Okay, you want me, right?" Beck: Yes, but also dismal statement on the state of San Francisco. Abrar: Oh yes, absolutely. It was a really hard process, Craigslist and you know, Apartments.com, and Trulia, and all the platforms that I was on all the time. Beck: Which is like a full time job. Abrar: It is, is, it takes a lot of time out of your day, and then finding a roommate, and it's a process, yeah. I don't envy anyone who's going through it right now. Beck: No. No, 'cause heads up everybody, it hasn't gotten better. Beck: So, when you came first to San Francisco for the internship, I want to go back on that for a second. Beck: What struck you about this place, and this tech world? We'll just call this Silicon Valley, versus where you came from, Illinois at the local paper, and such, and that university life. Abrar: Yeah. I love the fact that you have access to things, to big names, to big companies. Like, as part of my internship I got to go to Pixar, and see an advanced screening of Coco, and write about it. Where else do you get to do that, you know what I mean? Beck: That was a great film by the way. If you haven't seen it. Abrar: It was, I highly recommend, and that I mean, I think to this day as one of my favorite things ever done at CNET, and I got to do it as an intern. Like, they trusted an intern to go to this incredible studio, and write the story, and you know, it's not like they put weight on you of like, "No pressure," like, "You better turn out something good," like no, they're just like, "Here's something you should go to," you don't feel a lot of stress, or pressure, and you do it, and it's like that for any company you go to, or any exec you talk to, or whatever it may be. Abrar: So, you have access to these things, but you don't feel overwhelmed, or stressed about it. I mean, you take it seriously, but it's just part of your job. You just do it, and that's it, you know? So, just that access is really incredible. Beck: And at an intern level. Beck: That's what I'm really surprised by. Is that still very much the CNET ethos there? Abrar: Yes, they definitely put a lot of trust into the interns, and you're treated like a colleague, you're not treated as an intern. I mean, you are an intern, but you get to do the kinds of cool stuff that you want to do, and people respect you, and work with you as an equal, which is fabulous. Yeah, I know. Beck: Yeah, the face I'm giving her right now you guys. Abrar: I know, she's like rolling her eyes at me. Beck: Wow, that sounds like a great position, fantastic. Well now, let's go into what you're doing at CNET, what keeps you busy day, to day? I'd love to hear too, the inter-workings of how is a day for you, what is happening? How much time do you spend in your inbox for example with pitches, versus being out in the field, and doing everything, and articles that you cover include everything is we're looking for from potential IPOs of tech companies, to crypto space, fights between big conglomerates like the Qualcomm's, and Apple's of the world, Instagram. I mean, you have quite an array that you cover here, Superbowls even been mentioned. So, what is it like day, to day? Tell us what you do. Abrar: Yeah. So, I try to dedicate only about a half hour to opening the most important emails in the morning, because you could just stay there forever. So, I like to get that out of the way as soon as possible, so I can actually jump into whatever longer feature I'm working on. It might be a cultural related feature, it might be a health tech related feature. I've lately tended for the past few months tended to focus on more of the health tech stuff, but I'm also, you know, broadening the kinds of things I write about in the culture space, or whatever it may be, and so I do that for about two hours, or so, two, and a half hours, and the reason I have such a range of stories that you had just pointed out is, because I work on our version of kind of like a breaking news desk. So, that exposes me to a variety of topics, and new companies, and products, and is an excellent way for someone like me who's kind of new to the industry to kind of learn about those companies, and products, and people. So, I do that for three hours, and then the last two hours of my day, I kind of go back to whatever longer feature that I'm working on. So, it's all about balancing kind of the long term with the short term, and all about time management. Beck: It sounds like you also have a very specific cadence to it. 30 minutes, two hours. Abrar: Oh yeah, I try to keep it that way, yeah, exactly. Beck: It keeps the sanity. Abrar: Exactly, exactly. It's good to know what I'll be doing at a certain time. Beck: Then in your inbox, with all the pitches you do receive, and especially if you're just kind of, I mean, the array that you do is so huge. Oh my God, what is it like in there? Is it just publicist mayhem from hell? Abrar: It's pretty heavy, yes. I think people who have worked in journalism longer obviously are probably envious of my inbox. I'm sure it'll get worse as we go on, I'm sure, but it's hard to kind of pick out, you know, what's interesting to me, or what I'm able to do, just because there's only one of me, and I wish they were more, and so I do my best to really pick out what is most interesting to me, or what's most feasible for me to cover, but that's definitely a challenge for me is kind of weeding out the best things in there. Beck: I mean, how do you do that? Is it just, "Let me take a look at the subject line real quick?' 'Is it a name that I know?" Beck: What do you do? Beck: Now interesting. You don't just trash it, or spam it, you mark it as 'Read'. Abrar: It's weird, I wonder if I'm like an email hoarder, like I don't understand. Maybe I'm scared to throw something away, 'cause it might come in handy, even though I'm 99 % sure it won't. Beck: There seems to be some people who will just trash, bam, okay, but then there seems to be quite a conglomerate that holds them there, because what if I need to search really fast on whatever that tech company was, blah, blah, blah. Abrar: Exactly. What if I change my mind? Abrar: 'Marked as read', I know. It's, yeah, it's an interesting habit I know. Beck: Pet peeves of publicists, you have any? Abrar: The, "I emailed you yesterday, I'm gonna email you tomorrow, and the day after, and then the day after, like over, and over, and over, again about something that isn't even that pressing," don't do that. Abrar: Give me some time. Beck: How many times is the followup? Is it three, four, five, plus? Abrar: Oh, I think I've had four, or five that happens. Usually people like stop at one, or two, and like use some, you know, whatever, but some people are just really, and then that just turns me off. Like, I'm not interested anymore, you know? Not that I was in the beginning. Beck: Even if it's the best thing ever. Abrar: I know. It's like, don't be badgering me. Yeah. Beck: Okay. Well, is there something you are looking for that is helpful for people to know? I know you just said, 'Oh, it's so wide', but anything that really sticks out to you? I know you have some kind of personal interests that excite you, if you could tell us. Abrar: Well, I love stories that are about people, and about the ways technology is impacting people, or making their lives better. Whenever there's an anecdote that I can incorporate into a story, it immediately becomes so much stronger. Abrar: So, if you can give me a person who has tried this said product, and it's changed their life in some way, that's going to resonate with me, with my editors, and with readers. So, that definitely kind of gets my attention. That's I think one of the best ways to get me like, 'Oh this', you know, if you include that in your email, like a person who has tried that, yeah. Beck: [inaudible 00:20:46] to do it for people, got it. Beck: This is a little bit off topic of what we're chatting about when the inbox, but coming out of the inbox, you are trilingual. Beck: You're able to speak English, Arabic, and Spanish. Beck: How has that helped you in your job, if at all? Abrar: Yeah. Well, I haven't necessarily spoken with someone who only speaks Arabic, or whatever it may be yet, but I think perhaps, you know, me being Arab-American helps me see things in ways that other people don't, or I've had experiences that other people don't. I like to think that I understand, you know, what issues are important to certain minorities. Abrar: I'm still learning obviously, but I think maybe just having an open mindset. There's all those studies about how the more languages you know, that your brain is probably, there's an advantage there I would like to think. Abrar: Right, exactly. So, I think that's been helpful. I look forward to perhaps in the future, leveraging my ability to speak Arabic for example, and getting something that maybe someone else isn't able to get. Maybe I can talk to somebody, and get a certain story that's unique to them. Beck: Yeah, I would think so. Abrar: That would be great, yeah. Beck: Yeah. If you had to go back, and it's not that you've been a journalist for 20, or 30 plus years here, or anything, but if you had to go back, just rewind a little bit back to Illinois, back to when you were still in high school, back before maybe even your sister was in the realm of journalism, and you're thinking of 'What do I want to do when I grow up?' Would you still pick journalism now knowing what you know? Abrar: In a heartbeat, yeah. I'm so lucky. I think I talk to my friends, and I hear them talk about their jobs, and I am not jealous of what they do for a living. There are people who have really cool jobs out there, but I think the experiences I have, the opportunities I have, the people I get to meet, the fact that I have the power to release something I've written into the world with the click of a button that thousands of people will read, that is a power that I don't take for granted, and that I really appreciate, and love, and enjoy, and I'm so grateful that I have this opportunity, and so yes, I would definitely do it over again. Beck: And then related to that, this is one of the questions we like to close, and wrap up with is the future of journalism. What does that look like from your perspective? Abrar: That's an excellent question that I wish I knew I had a good answer to. Beck: Well, and it's a very wide question. So, many people take it many ways. Abrar: Yeah. Okay, well I'll think of it this way. I would like to think that we have more diverse journalists in the industry. I would like to think that more people perhaps like me think, 'Okay, people like me aren't being represented the way I want them to be represented, and so the only way we're going to change that as if I dive in, and I have my byline on something, or I have my perspective on something', and so I would like to think that it becomes something that's open to more people that is more appreciative, and understanding of different people, and is more welcoming, and accepted and just a better place for more people to have a voice, because that's what journalism is about, voice for the voiceless, right? Beck: Yes. Well, we're going to end it there. Abrar: Yes. Mic drop, right? Beck: Ah, mic drop. Thank you so much for being here on Coffee with a Journalist. Abrar: Oh my gosh, thank you for having me. Beck: Abrar, this was so great. If people want to find you, should they go to Twitter? Should they go to your inbox? What would you suggest? Abrar: Yeah, either one would be great actually. Abrar: Either one, yeah. My DM's are open on Twitter. My inbox is available for any, and all to give me good pitches. Beck: Good pitches, double emphasize. Jered: Thanks for listening to this week to Coffee with a Journalist featuring Abrar Al-Heeti from CNET. 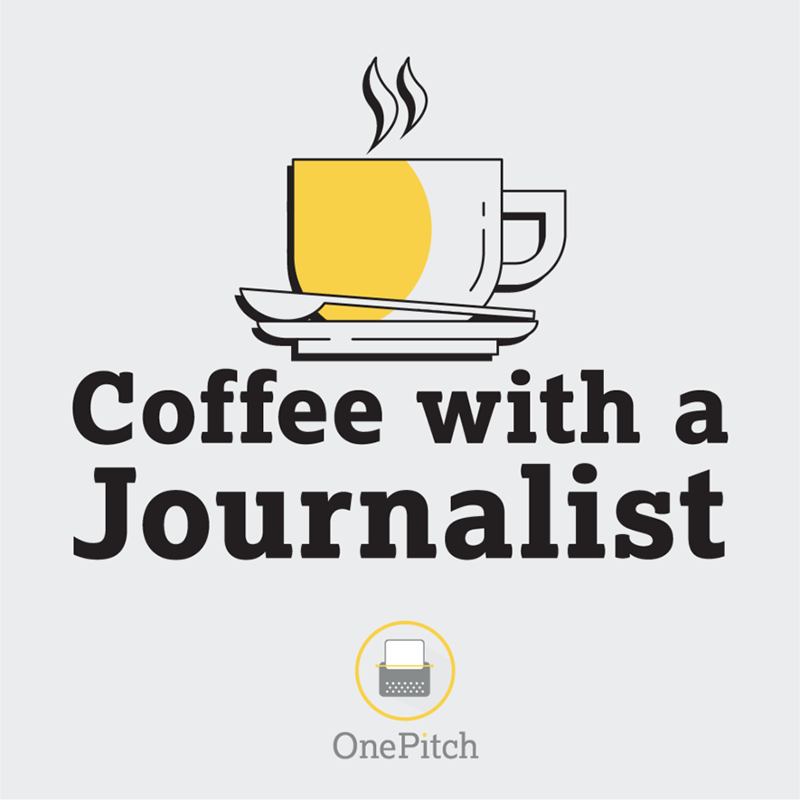 If you're a journalist who loves coffee, or a publicist who loves this podcast, we'd love to hear from you. Head to Onepitch.co to drop us a line. Until then, let's end bad pitches, and start great stories.